The Eritrean People's Liberation Front (EPLF) (Tigrinya: ህዝባዊ ግንባር, ህግ?, Arabic: الجبهة الشعبية لتحرير إريتريا‎‎) was an armed organization that fought for the independence of Eritrea from Ethiopia. 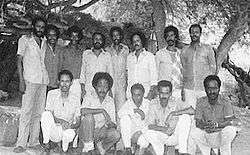 It emerged in 1970 as an intellectual left-wing group that split from the Eritrean Liberation Front (ELF). 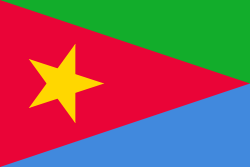 After achieving Eritrean independence in 1991, it transformed into the People's Front for Democracy and Justice (PFDJ), which serves as Eritrea's only legal political organisation. ↑ Johnson, Michael; Johnson, Trisha (April 1981). "Eritrea: The National Question and the Logic of Protracted Struggle". African Affairs. 80 (318). 1 2 Doris, Burgess; Cliffe, Lionel (Spring 1987). "EPLF Second Congress". Review of African Political Economy. 14 (38): 107. doi:10.1080/03056248708703724. Retrieved 2007-09-07.